Lately, I find myself talking a lot about ice cream. I’m not eating ice cream because it is in the negatives outside (brrr). The conversation I keep having is about different foods that are impossible to control yourself around. For me, it is a hot steaming pizza of cheesiness. I have discovered that I am in the minority among my friends. If there is ice cream in the house, they cannot stop eating it – which I understand because of my love of pizza. What if the ice cream you were eating was actually healthy and you made it yourself? No big buckets of Cookies-n-Cream screaming at you from the freezer –no, a homemade concoction. What if your homemade ice cream had almost zero grams of saturated fat? If you have a high power blender, use it for this recipe. I have a $50 blender so I use my food processor to get the right consistency. 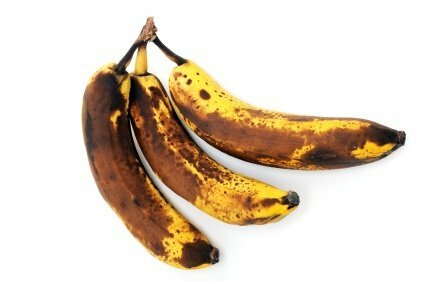 Slice bananas and place slices on a cooking sheet in a freeze for 1-2 hours. Using either a blender or food processor, blend the frozen bananas and peanut butter until smooth. This recipe doesn't have much "curb appeal". If I'm going to eat a banana I prefer it's natural state. Sorry, this is just a bit much! Easy, healthy, kid and mom friendly was what came to mind when I read this post. I have frozen bananas in the freezer and will try soon! Thanks for the banana & peanut butter "ice cream" recipe. I've been having a hard time controlling my ice cream cravings. I'm excited to give your recipe a try! I love this recipe when I am craving ice cream. It fills a need! This is super easy with any fruit really, anyone have a Yonanas machine? Its pretty great !! Great stuff Lisa. I love the taste of bananas but hate the texture. I also love ice cream and peanut butter, so I'll definitely give this a go today. I'm wondering about the Points+ value, though. Bananas are 0 and 2 tablespoons of no sugar added natural PB are 5 or so for the entire batch. Am I cheating if I count a serving as only 2 points? 😌 Thank you, I always enjoy reading your blog! I love the recipe! I keep hearing about banana ice cream but didn't realize it could be so simple. I will try this recipe this afternoon for an after school treat! Thanks! I really wish I liked bananas. Do you think this would work with a different fruit? It's single digits here, but I still find I want ice cream. And honestly, what a great way to use up those bananas that are going bad! I hate wasting food!!! I have tried this before and it is really good. I always seem to have frozen bananas in the freezer, too, but never think about doing this. Nice reminder! One thing that I have added before is a teaspoon or so (to taste) of cocoa powder. Yummy! great tweek although I use my brown bananas for a simple bread recipe. I think my hubs is the only person in the world who will eat a banana that looks like this! BTW, we hardy New Englanders eat MORE ice cream than any one else in the nation - - cold, snow, frigid temps be damned. Great idea, both myself and my grand babies love ice cream, bananas and peanut butter, so I will definitely make this for them plus I always keep bananas in the freezer for smoothies. Good idea - I was thinking PB2 as well - as someone above mentioned. I also have a basic (cheap) blender, and no food processor, but I'm going to give it a try - Immersion blender maybe? Thinking that a sprinkle of cinnamon might be a good addition! I've seen the Yonanas machine, but didn't need one more thing in my kitchen - thanks for the easy route! Banana "ice cream" is the way to go - don't knock it till you've tried it! I've been adding a third - half cup ff plain greek yogurt and either some tart cranberry sauce OR PB2 and a some unsweetened cocoa - both with great results and the taste is surprisingly un-banana! Perfect in the Cuisinart mini-processor. How about almond butter? Would that work too? I love this recipe! As someone who is lactose-intolerant, this is my go-to treat. I sometimes use just bananas, a bit of cocoa powder, and a pink of sugar for a yummy chocolate ice cream. I've made it for so many people who can't believe it's bananas. I love this! I just don't think I'll be able to control myself and eat only a half cup but it's worth a try. I was thinking about what you said abt it being too cold. Ben and Jerry's start up story explains why they were so successful in Vermont. People ate a lot of ice cream in the winter. They believe eating cold foods in winter helps to regulate your body temperature. Even better, I have a Yonanas soft serve icecream maker. Zero points in Weight Watchers, it uses only frozen fruit to make soft serve icecream. Yummo! This recipe spoke to me so strongly that I had to make it for my family immediately! Was it ever a success! I adapted the recipe for my peanut butter- and chocolate-loving crowd. Results: very creamy and delicious, wiith amazing "mouth feel" (Note: our family's going dairy, gluten, and added sugar-free for a month, so this was an incredibly satisfying dessert find! Thank you for the inspiration, Snack Girl! Place all ingredients in food processor to blend until creamy. Stir a few times if necessary. Bliss out!! OMG! Amazing idea! So many of us are always looking for that last night snack, and this could be the healthy cure! I am lucky enough not to fall into that category of people, but I know many people that do and this will truly be a benefit!! I have tried two from Pinterest one was bananas and strawberries...SO GOOD! The other was bananas and yogurt and chocolate. I gotta try this one. Here is a chocolate peanut butter banana ''ice cream'' pie recipe I received in my inbox today. 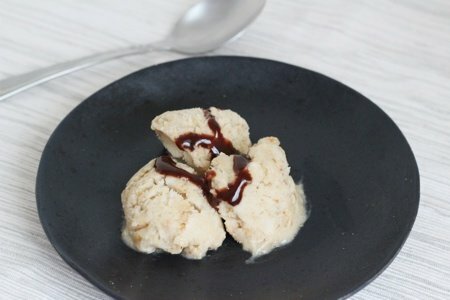 I thought it might be helpful for those who are lactose-intolerant or watching their calories [because its kept in the freezer for portion control] and it looks so delicious. I've tried this before tho never with peanut butter. when I tried this with banana and other fruits, what I noticed was that if you freeze it for later consumption, it always freeze far too solid to be "icecream" texture. Overall it just felt more like a banana/fruit smoothie if I eat/drink it immediately after blending, or frozen fruit smoothie that I gotta scrape at with a spoon if I freeze it. XD that said, perhaps the peanut butter will add a bit of fat/creaminess to it that makes it freeze better? I think maybe if I made it with some kind of creamy product previously it might've came out better. but I have to admit, I think bananas are the best fruit for a "closer to the real thing" home made icecream without using heavy cream and an icecream machine.